Master Trooper David Deuter was killed after being struck by a semitrailer while making a traffic stop on the Indiana Toll Road near Howe in Lagrange County. Master Trooper Deuter was standing next to the driver's side door of the vehicle when he was struck. The suspect was arrested and charged with reckless homicide. 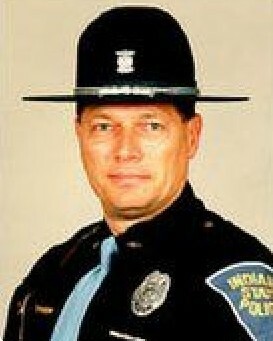 Master Trooper Deuter had served with the Indiana State Police for over 26 years and was assigned to the Toll Road district. He was survived by his wife and four children. In the mid 1980s I was doing ride alongs with the LaGrange Sheriff’s Dept. That’s when I met Dave and he met his future wife Deb. She was a dispatcher for the Sheriff’s Dept. Looking back they were a great couple both had a great sense of humor. In 1994 I went to work on the Indiana Toll Road and worked with Dave on countless crashes and traffic control details. On that terrible day I was a Toll Road Maintenance Supervisor and I was on my way home from the Steuben Maintenance Facility. I heard the call for a crash near the 127 MM numerous 911 calls. This would be on my way home. As I responded they reported a trooper was involved. I knew that I was going to be the first on scene. I was. As a first responder/firefighter for 34 years that scene is one of two in those years I wish I’d never seen. Dave was just a super great guy, a huge sense of humor and a big laugh. I was at the Toll Road until it was leased and everyday literally, out in traffic I thought about Dave. Every time I pass a State Trooper stopped alongside the road, after all these years, I think of Dave and that day. My god continue to bless Deb and their girls.